The FTM-2 has been designed to route occupancy bus information from one route to another. This is accomplished by monitoring the position of the turnout and routing the signal information in the proper direction. The path that is not selected receives a stop signal while the selected route displays the appropriate aspect based on the occupancy status of the blocks surrounding the turnout. This particular turnout module not only routes the signal information but also drives four signal heads capable of displaying three aspects, STOP, APPROACH and CLEAR. This can be accomplished using target or search light signals that have three separate LEDs, or by using search light signals that use bi-color LEDs. The FTM-2 board operates similar to a Cascade Module. A STOP signal on the input will produce an APPROACH aspect on the output. An APPROACH signal on the input will produce an ADVANCE APPROACH aspect on the output. This Turnout Cascade Module has been designed for universal operation. The occupancy bus is compatible to work with any Free-mo module that follows the Northern California Free-mo wiring standards for the occupancy bus. * Operates four, 2 aspect or 3 aspect signal heads. * Flashing advance approach signal. * Requires category 5 cross over cables to connect to other modules. 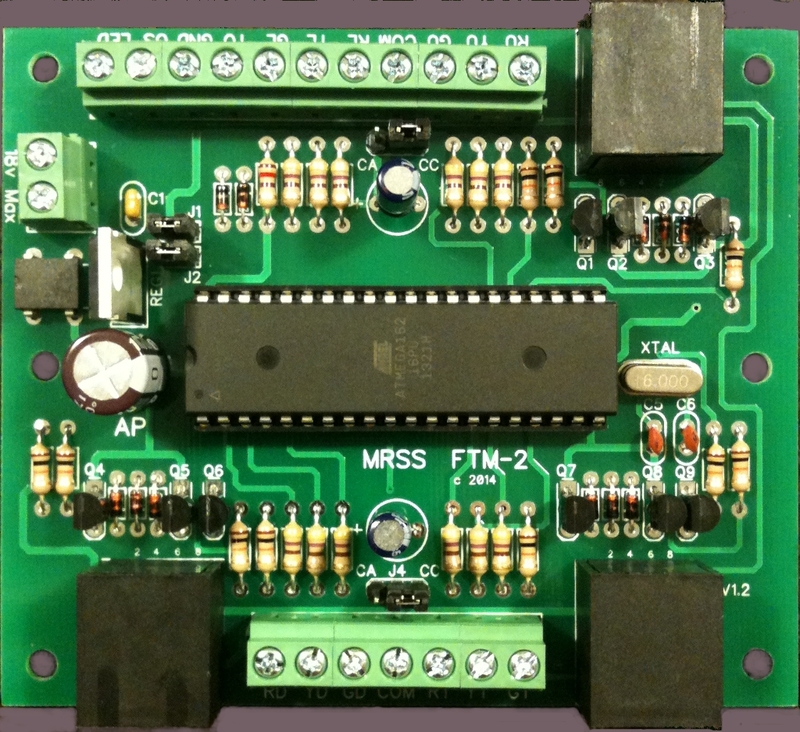 Connections to the FTM-2 board are very simple. There are two sets of terminals to connect power and LED signal heads. The FTM-2 board operates on an AC or DC input voltage between 8 and 18 volts. The use of any higher voltage source will damage the circuitry. GT - Green LED for the through signal. YT - Yellow LED for the through signal. RT - Red LED for the through signal. COM - Common lead for signals. GD - Green LED for the diverging signal. YD - Yellow LED for the diverging signal. RD - Red LED for the diverging signal. GL - Green LED for the lower approach signal. YL - Yellow LED for the lower approach signal. RL - Red LED for the lower approach signal. GU - Green LED for the upper approach signal. YU - Yellow LED for the upper approach signal. RU - Red LED for the upper approach signal. The FTM-2 can be powered from several sources. The maximum current draw for the unit is about 60mA. -- Connecting the board to a 12 volt power supply. The recommended optical sensor to use with the FTM-2 is the OPB704WZ. The sensor is made up of an infrared LED and a photo transistor. Another option would be to use standard infrared LEDs and photo transistors. Either option will work when both are connected in the same manner. For proper operation, the signal type used must be matched to the chart in the installation instructions and the on board jumpers must be set correctly. There is no need for external current limiting resistors between the signal and the FTM-2 board as the resistors are built onto the FTM-2 board. The FTM-2 has been designed to drive LED signals that require less than 20mA of current directly from the terminal screws on the board. Incandescent bulbs can be used as signals but cannot be connected directly to the FTM-2 board. Doing so will damage the circuitry. A set of transistors or lamp drivers need to be connected to the signal output in order to operate signals that have light bulbs. The FTM-2 can be connected to other Free-mo signal boards that are compliant to the Free-mo wiring standards for signalling.